The untimely death of President John F. Kennedy shocked a nation, and America stills mourns the fallen leader as a lost symbol of hope and progress. 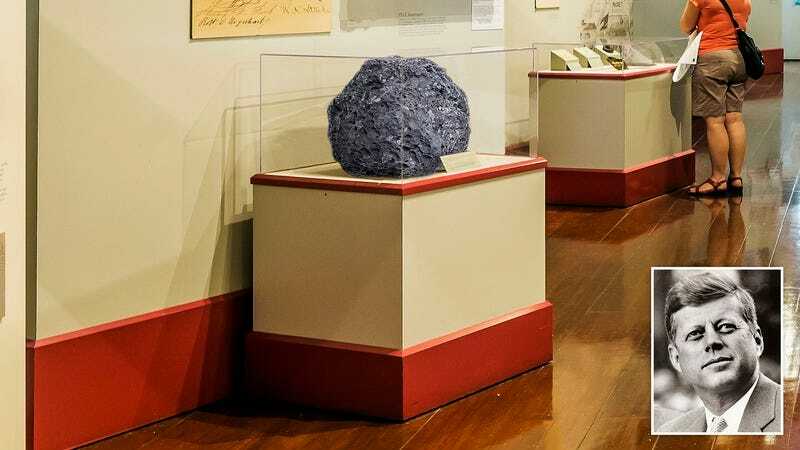 Now, more than 50 years after President Kennedy’s death, a crucial piece of history from that tragic day will be on display for the public: For the first time in decades, The Smithsonian will be exhibiting the asteroid that hit JFK in the nuts so hard that he died. The National Museum of American History is displaying the testicle-slamming meteorite as part of a special exhibit about JFK’s final moments, when his life was abruptly ended at age 46 by a softball-sized iron-nickel meteorite colliding with his groin with so much nut-blasting force that it killed him. It’s a rare look at an artifact that changed the course of U.S. history. On a clear blue day in 1963, JFK was walking through the White House Rose Garden when a shooting star streaked across the sky and whacked him right in the crotch, causing Kennedy to yelp, “Yowch, right in my huevos!” JFK then clutched at his groin and keeled over dead from how much his balls hurt. In the blink of an eye, an inspiring president was cut down before his time and America was forever robbed of its innocence. If you get a chance to make it to The Smithsonian while the meteor that nailed JFK right in his family jewels is on display, you definitely don’t want to miss the opportunity. Every American alive that day remembers exactly where they were when they heard that a high-velocity space rock had donked John F. Kennedy right in the beanbag and made him die on account of his nuts getting pulverized into straight-up dust. It’s one of the most important events in the history of the United States, and now The Smithsonian is offering an opportunity to see the groin-obliterating asteroid up close. In addition to viewing the asteroid itself, museum visitors will also get to see related historical treasures like the pink Chanel dress Jacqueline Kennedy wore when she shouted “Oof! That’s gotta hurt!” and the ice pack Secret Service agents fruitlessly tried to put on JFK’s nut sack to reduce the swelling. It’s an educational experience that will let visitors relive that tragic day. President Kennedy’s death is an indelible part of U.S. history, but the meteor that beaned him right in the cojones is seldom available for public viewing. If you’re interested in our country’s past, you owe it to yourself to visit The Smithsonian during this incredible exhibit.